Having completed the last panel (actually, I have a further 'Uccello drawing' to create and paste into several panels), I am now turning to the cover and publication design. The course is thoughtfully organised in terms of having all this work be part of semester 2's Comics Production module. 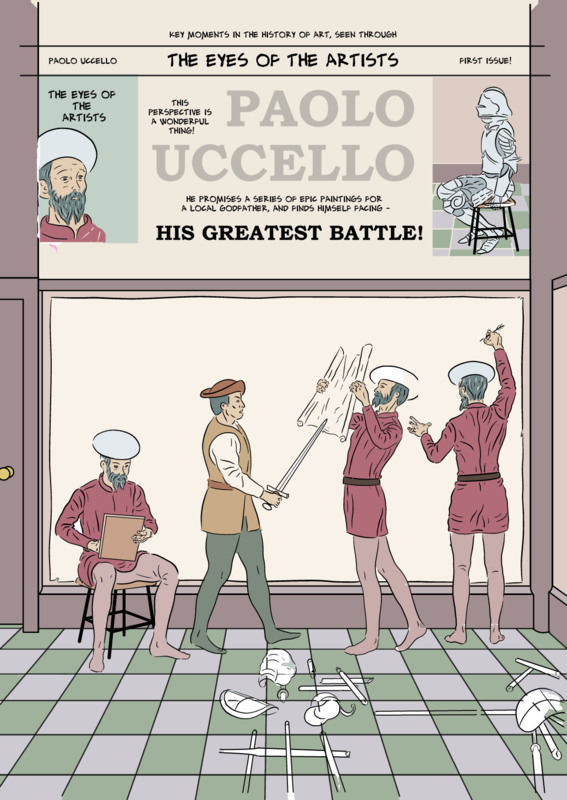 Unfortunately for me, after designing that material, based on my major project being a continuation of semester 1's comic about Vermeer, I refocussed my project to a series of comics about different artists, ultimately deciding on Uccello for my semester 3 Major Project changed tack. I'm getting the proverbial 'deja vu all over again' since I spent much of the time in the Production module finishing of my comic from semester 1. Had I not had to do that I would have time, I would have had time over semester 2 to do the revised design work, that I'm now having to do in semester 3! I hope I get some recognition of having to do a whole extra design/production job as well as my major project. That said, I'm not totally starting from scratch, as I did some basic design/concept work earlier in semester 3, as shown below. Below is my sketch for the back cover - essentially takes some of the panels from the interior, and sets up the story: the commission, and the fact that it is a challenge, and a step up from his previous work. I imported the images into Manga Studio, and took them slightly further, as shown below. I don't have a lot of time at this stage, as I still have some texture/toning/lettering work to do on the interior pages, ands some final work on my business plan. To get the cover done, and leave enough time for the rest of the work, I've put the cover together by cutting and pasting elements from the interior pages: Uccello sitting drawing from page 1; Rocco brandishing his sword at Uccello from page 17; and Uccello at work on ht big drawing from page 21; background from pages 20-21; and the armour and props on the floor from page 12. For the Uccello/Rocco one that 'shot' was cropped in the interior, but having saved the 3D models I was able to add the legs accurately, and fairly easily - the 3D models won't resize with the rest of the drawing using the Transform function, but it wasn't that much more difficult to do this using the 3D model manipulation tools. I think the result is pretty convincing - I did anyone (without closely comparing it to the interior) would guess I'd done this. I've also started on some of the design elements. The top have design is based on classic Marvel comics with the inset bow identifying the character, the horizontal band for the company nam, and the mixture of typeset and hand-lettered text. I think my combination of type and hand-lettered style fonts works quite well, though the spacing/composition could probably be finessed. I like the left alignment on the PAOLO UCCELLO 'logo', with the two 'LO's left aligned. 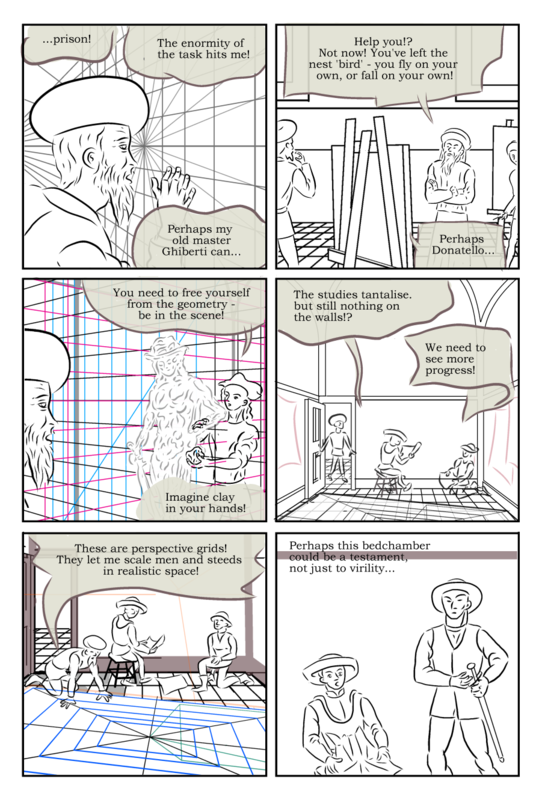 I placed the text 'This perspective..' to fill that space - it's to be a word balloon, as shown on my sketch. I might be able to fit it into the inset box. My original plan had been to fill that space with an image/silhouette of a rider, from one of Uccello's paintings - the rider in the painting to be seen (in my rendition) on the back cover. I've just been doing this in Manga Studio as I find it helps me to be working on the picture and design elements together. I may take it into InDesign to finalise, MS isn't very clever with, for example, getting the different bits of text aligned to centre. I'm not sure if it will let me import (after outputting from MS as aPSD) the text in editable form - I'll make some enquiries. More tech problems, sigh... er, I mean opportunities to find solutions. I use Dropbox (cloud storage) to save my files - the main advantage of this is that I can access my work either in my studio, or at home. In these final days before hand-in, to maximise my productivity I have doing a day's work in my studio, focussing on the actual drawing, then going home and doing a more hours working on the work-a-day elements like fixing the lettering, applying texture and tone layers consistently to pages, and generally fixing any glitches or niggles. The problem I have with Dropbox is that, as a back-up save (in my use of it) it doesn't save to Dropbox in the same time it takes to save to the computer, so it's not unusual to find that I can't access from home the version I just completed before I left the studio. I've learnt how to work around that, in fact it's partly why I do colouring etc at home - that's usually on pages I've done some time before, and therefore are accessible inter most recent versions on Dropbox. Today, though in the studio, I can't access any of the work i did at home last night. Additionally, while Clip Studio's page management system is clever enough to know when the file has been changed elsewhere, and ask me if I want to update to that, I'm not sure how it would work if I had two sets of changes made in different places, so I'm avoiding finding out! For the panel I'm working on (post immediately below), I've just copied what I want into a separate single page document, and from there I'll post onto the page-managed version later. I had completed, a week or so ago, the two-page spread that makes up pages 20 and 21 (below). However after doing that i decided that the last panel made more sense over on the 22nd, and final page, which then is able to feature the protagonist having a concluding engagement with each group of supporting characters. That left me a panel to fill on page 21, and I thought a (possibly) silent moment of Salimbini (the patron) assessing the progress (he's expecting to see painting on the walls, but there's only a drawing. Before I arrived at the final version of panel 3, I had tried a few poses for Uccello waking/getting up. so one of them might be right for the new panel. As it happens I also drew a panel yesterday (for page 15 - see post immediately below), with a similar pose to what is required here - Sailbini with his hand to his chin. This took a significant length of time to wrangle the 3D model into such a specific pose - getting the hand moved into the pose is one thing, but connecting that with the chin is quite another, I kept ending up with the hand behind or in the middle of the head. I think it will be good to adapt that pose for this panel, not just because I have little time left, but also because i think is good to reprise visual details - the things which are similar hopefully emphasise the differences. In the case of this scene, I hope it will (consciously or sub-consciously0 remind readers of the earlier, similar scene, and so the escalation of the situation. That would be helpful here, at this climactic, 'how will end' moment. This panel probably should be zoomed in, so that it shows a closer up view of the finished drawing. I copied the background from the existing version into a fresh Manga Studio page, and increased the size of this within the panel border to maximise the amount of the drawing shown, but also to include just enough of the surrounding wall and woodwork just to make it clear that this is a zoom into the same scene, and also to provide an aesthetic composition within the panel border. 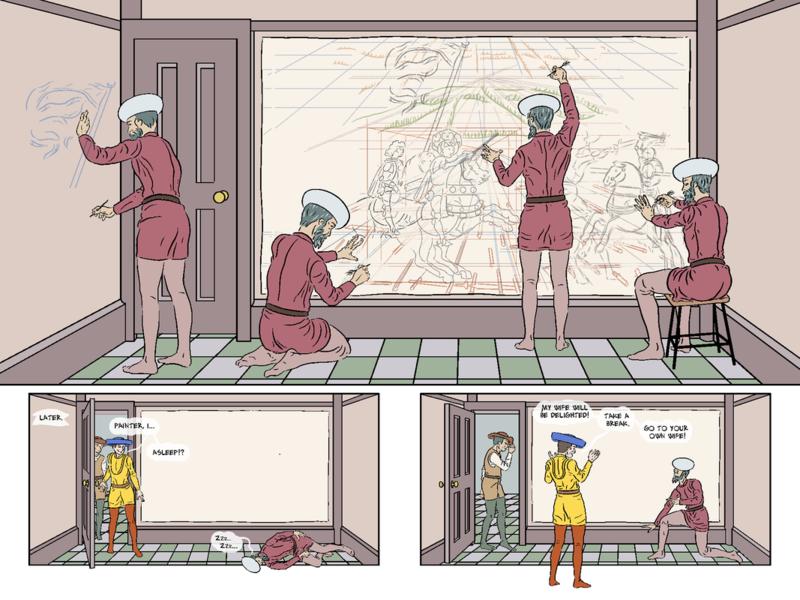 After cropping my source scene, I realised I needed a copy showing the wider room and tile pattern to help position the figures correctly in perspective space, so I pasted one in and reduced the opacity, so I could refer to it without it distracting from the drawing in progress. 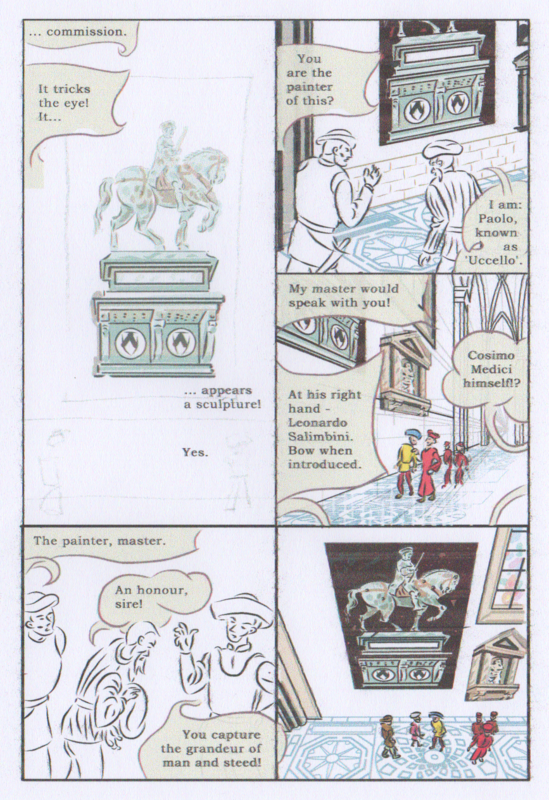 Next I found and copied in the chosen 3D models (I now always keep the ones I have used in hidden layers within each page) - Salimbini from page 15, and Uccello from page 20, panel 1 (above - lower left panel). I then amended these - for Salimbini, just rotating it slightly, to match the angle we'll see in the panel on the next page, and for Uccello, trying various adjustments to the sleeping pose to suggest various moments within the process. 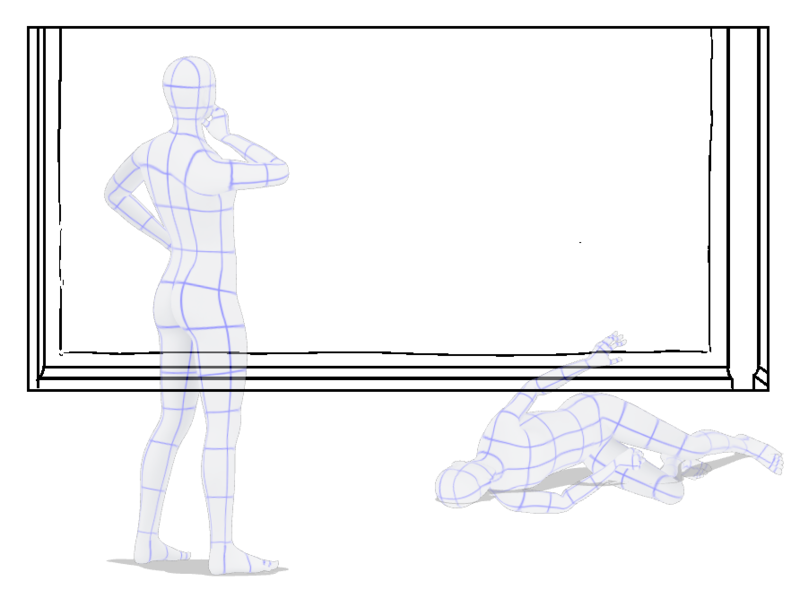 In working out the poses, I did revisit and tweak the cropping of the zoomed in room view to crop the figures aesthetically. This was easy for the standing Salimbini, but harder for the recumbent Uccello, some options showed, for example, a bit of his head, which looked slightly silly and confusing. In the end just showing Uccello's arm stretching up and out from his position on the floor, seemed a visually appealing, and, i thought, witty solution. In theory I could have just drawn the arm without the bother of using 3D models, but I wanted to have the placement accurate in terms of continuity, and realistic in terms of bodily movement. I was also careful to check, e.g. that the figure was correctly placed on the floor, using the floor tiles, (outside the frame in this shot), as a guide. Finally, I took some care to place Uccello's hand to get the best placement, in terms of avoiding tangents with the horizontals lines of the paper and woodwork. Below is the inked version. I'll add some balloons for Uccello with 'ZZZ's and then a waking up grunt, just to make it clear what is happening. tI also pasted into my new document the Colour flats layer, to let me save a bit of time and have it fully ready paste in. 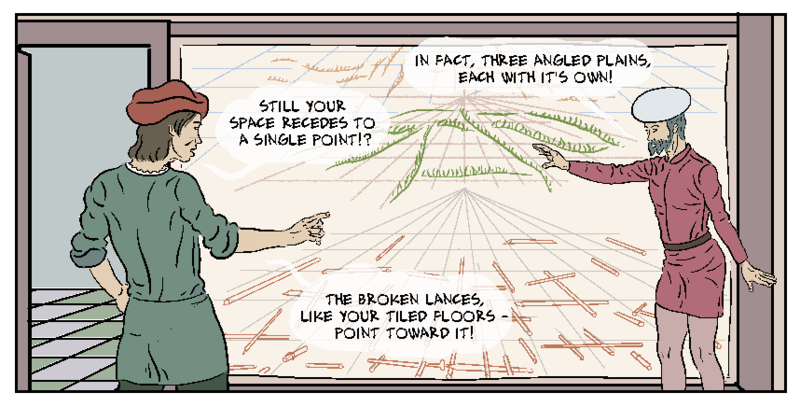 I just selected the areas with the old figures and dragged them out the panel, which means I can conveniently eyedropper the relevant colours, and so flat this (admittedly simple) panel in a few short minutes. I've now added text and balloons. 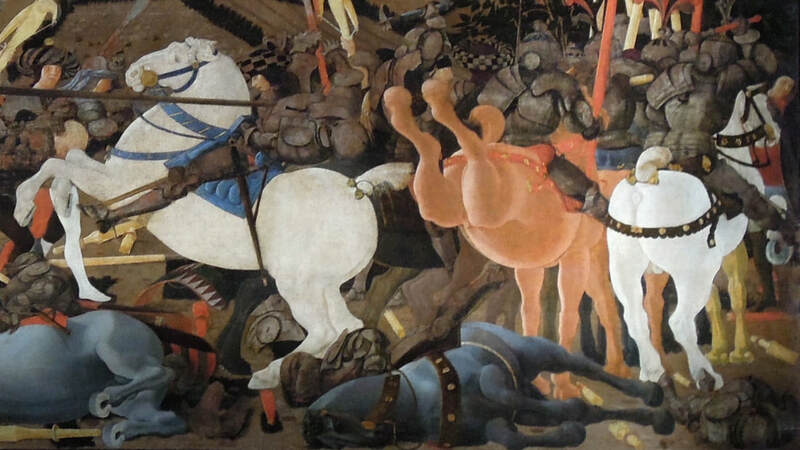 The next step is to paste in my already created drawing of Uccello's painting, which I used in the imagined battle scene (Page 19), when Uccello is wearing the helmet, and Rocco is 'helping' him imagine the battle. This drawing is a later (within the story) and so more finished version than that in the main panel of pages 20 and 21, (as at top of this post). I'll likely need to finesse the positioning of the balloons, in relation to the pasted in drawing. 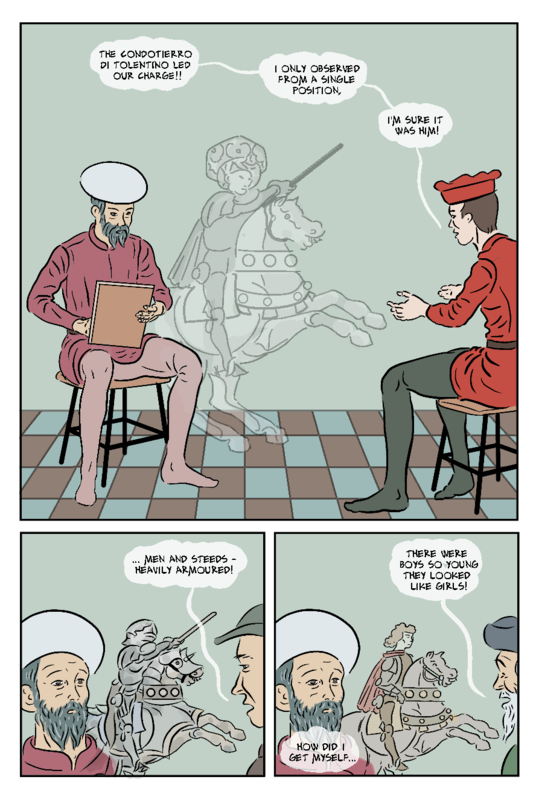 Also, in this case I have kept Uccello's sleeping noise balloons low in the panel, to reflect his physical position, and Salimbini's high in the panel. I did indeed have to rearrange the lettering, considerably in relation to the pasted in drawing (below). I still have to add the tail between the 'zzz' and 'grunt!' balloons. The other two balloons are Salimbini's thoughts, perhaps unstated. I previously tried using a set of little bubbles, in lieu of a tail, to indicate thinks bubbles, but it just didn't look good. Where I've used it, it's usually fairly obvious from the image whose thoughts it is. I'll leave this until later and see if I need to put a tail between them this two ballots/bubbles. In retrospect, I would also have ben better to have pasted the drawing in first so I could finesse the positioning of the figures in relation to it. It's fine, as it is, but i could have got it subtly but significantly better. Still, it's pretty good, I doubt anyone else will see anything wrong with it in that respect! The 'drawing' looks a bit pixellated in this 150dpi version - it looks much better in the original doc, and I trust it will in print. Despite my comments above, about wanting to get Uccello's reaching up arm positioned correctly, I am tempted to move it over to the left 1cm into that blank space. 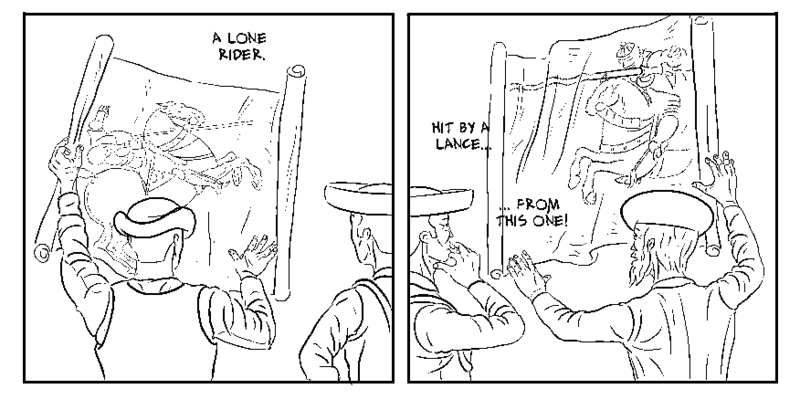 Although I have drawn the last page, I have some panels to go back and add, including one of page 15, as shown below. 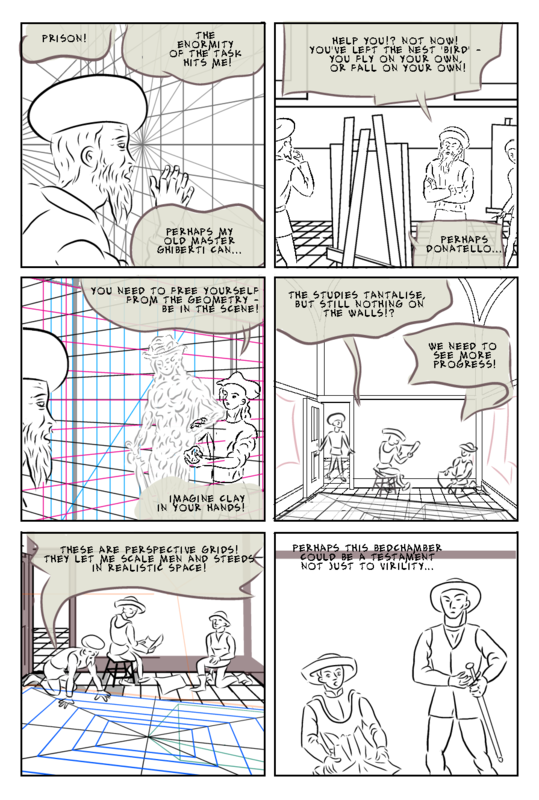 It's slightly technically complicated, as I've got to get from Uccello sitting in panel 4, while he stands holding up a drawing,to panel 6, where Uccello holds up a drawing as the patron, Salimbini, sits on his stool. Also, Rocco (the patron's 'major domo', in brown jacket) is there, so what is he doing? It's so long ago I drew this, I have been unsure what my initial plan was. I had been assuming the figure to the right of my sketch for panel 5 was the seated Uccello, but I I realise now that (from my roughly sketched hat! 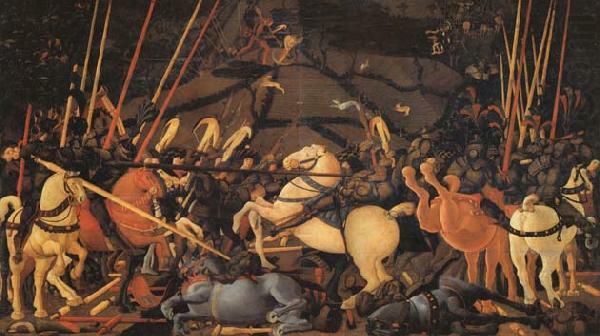 ), it is Rocco holding up the drawing, with Salimbini on the right, panel 6 then is almost a mirror image, with Salimbini turning to look at Uccello, who is holding up a drawing to juxtapose with the first one: two drawings of horsemen together now suggesting they joust each other. I think it will be confusing to have Salimbini drawn as if he is sitting, as we don't seem him in the act of sitting, or him on the stool - it's just the head height - which might just look like bad drawing!. Panel 6 was an early one, and may be worth redrawing anyway. I'm thinking now I need need to overall the drawings - it's probably better to let the reader have to imagine it - just as the patron is. 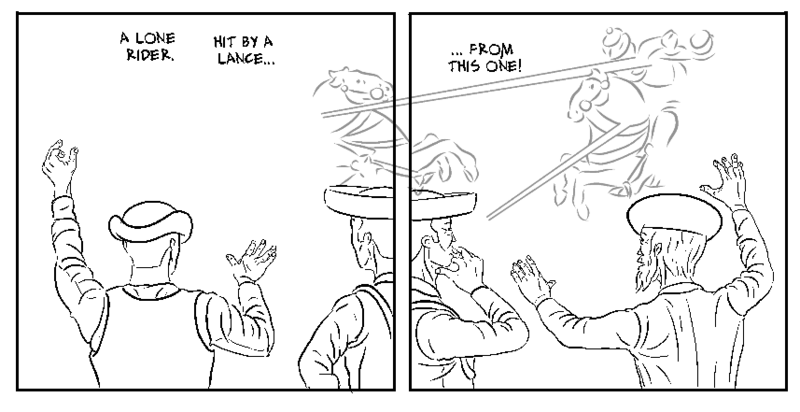 We see the two riders coming together in joust, anyway, in an imaginary/symbolic scene on the very next page. So I'm concluding that the arrangement works, if I just make Salimbini standing. 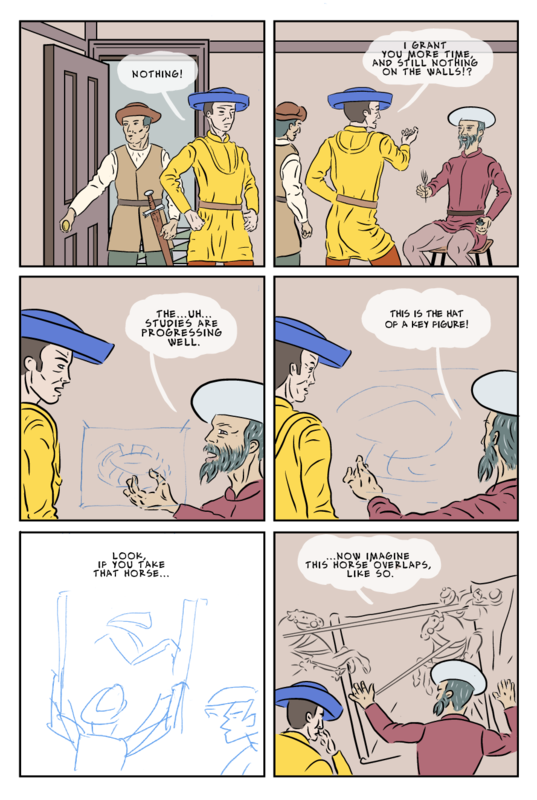 I had thought about turning it into a single panel, perhaps with a double image of Salimbini facing in each direction, but I think two panels will be better, as I captures that a moment has passed between Rocco holding up one drawing, and Uccello holding up the other. 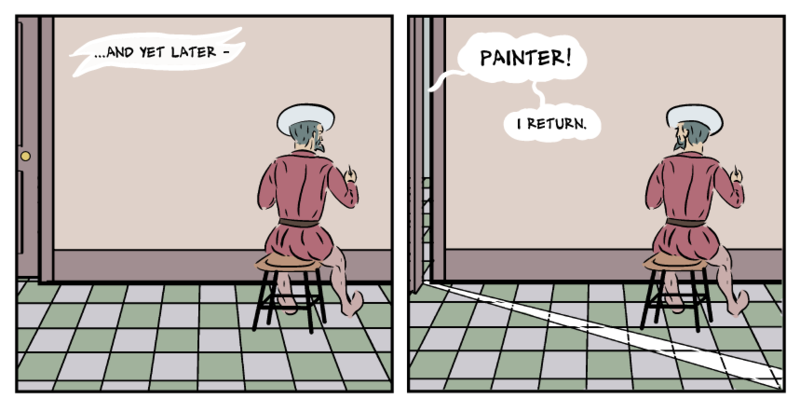 I also have to add the drawing of the hat on the wall in a number of panels. 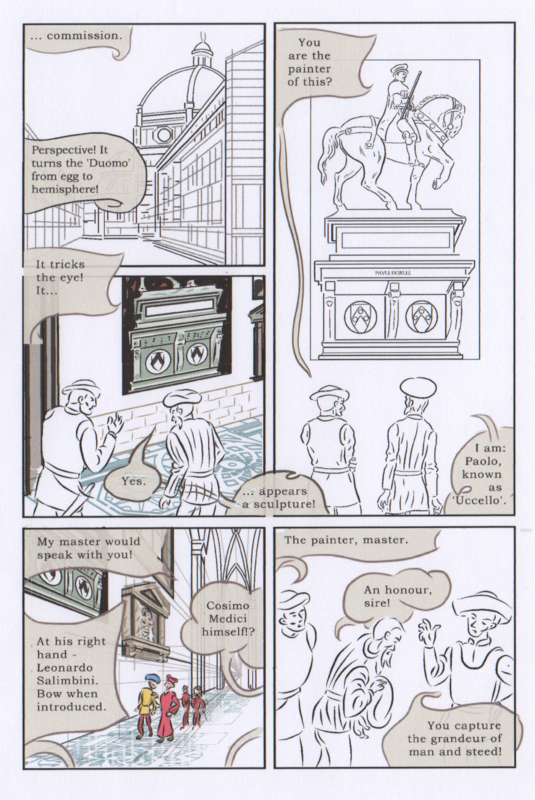 I also have to fix the lettering, from the widely spaced version seen on most of this page to the better spacing, and smaller size seen in panel 4, above. I've redrawn the figures for panels 5 and 6, ti work as a pair. I've still finesse the composition the horsemen drawings and the paper edges. I've now added the drawn images and the pieces of paper they are on - it was a bit of work getting these three elements and the word balloons, all composed together nicely. I placed the drawn images so that those parts Uccello didn't draw (i.e. they were hidden behind other riders) are hidden in the rolled parts of the paper.